Last weekend I realized that I've spent the majority of the summer so far laying in bed watching RuPaul's Drag Race. Three weeks after willingly getting four unnecessary teeth ripped out of my mouth, panicking over the potential for dry sockets, and experiencing what I can only describe as my body melting into a cloud of pillows as a result of some pretty strong painkillers, I forced myself out of bed and headed out for my favorite Louisiana summer tradition of waking up at the crack of dawn, putting on my overalls, and blueberry picking in the sweltering 8 a.m. heat. All in the name of crostata! Pro tip: blueberry picking is all fun and games until you realize that you have 8 pounds of berries that need to be tended to immediately. Luckily for me, the solution was an easy one: bake them into practically every single dessert known to man. Within the past week, I've made blueberry muffins, two batches of blueberry brownies, and frozen a good chunk of them. But the true superstar? This blueberry crostata. I was feeling extra ~*fancy*~, so I smeared the inside of the pastry with homemade blonde/caramelized white chocolate. If you've never had blonde chocolate before (a la Valrhona Dulcey), it's a deliciously toasty, caramelized white chocolate that will change your life forever. Don't worry about ordering Dulcey — it's a super simple operation to turn your regular old white chocolate into blonde chocolate at home: a quick roast in the oven, stir and repeat every five minutes for 40 minutes. The outcome is waaaay worth extra time, I promise! Buttery crust, toasty blonde chocolate, the most deliciously juicy local blueberries.... just do it. Whether you eat it alone or use it as a vehicle for your favorite vanilla ice cream, you need this in your life! Happy weekend fraaaands! Preheat oven to 266° F. Scatter white chocolate pieces onto a baking pan. * Bake the chocolate for 40 minutes, removing from the oven every 5 minutes to stir. (After about 30 minutes, the chocolate will caramelize and gradually turn amber.) Remove from oven and place into a bowl. At this stage, your chocolate might be lumpy and pretty gross looking. Don't worry! Stir vigorously until a liquid resembling melted chocolate forms. Pour into a glass jar and store at room temperature. Place the flour, sugar and salt into the bowl of a food processor fitted with a steel blade and pulse to combine. Add the butter and toss quickly to coat each cube of butter with flour. Pulse 15 times, until the butter is the size of peas. With the motor running, add the ice water, continuing to pulse but stop the machine just before the dough comes together. Turn the dough out onto a well-floured surface, roll it into a ball and form into a flat disk. Wrap the disk in plastic and refrigerate for at least 1 hour. To make the topping, use the food processor and pule together all ingredients until coarse. Set aside. Roll the pastry into an 11-inch circle on a lightly floured surface. Transfer it onto the prepared baking sheet. Smear half of the caramelized white chocolate in the center of the pastry. Top with the blueberry mixture, topping, and any extra blonde chocolate. Fold and crimp the edges of the pastry into to the center. Brush with butter and sprinkle crust with the remaining turbinado sugar. Bake the crostata for 20 to 25 minutes, until the crust is golden and the fruit is tender. Serve warm with ice cream for a killer dessert or at room temperature with a cup of coffee for a killer breakfast. Did you know that only EIGHT percent of New Year's resolutions actually get achieved? Crazy right? Remember that time I made an epic New Year's resolution to post a blog every week? Well.... I'm definitely not part of that 8%. So where have I been you ask? Suffering the miserable life of an undergraduate college student taking two too many classes, working one too many jobs and having the joy of commuting between two equally as dysfunctional households on different sides of one giant lake. Woe is me, lol. But it's over with. Finally!!! Somehow, I even managed to do well in school (after announcing that "everybody has a bad semester, and I'm okay that this one is mine") and even won an award for it! Oh, I went to a freezing cold New York, bleached my entire scalp, and drunk texted Molly Yeh about cheese fries in Texas in this period, too. Rest assured, I'm not leaving again. I've missed all of my lovely internet friends way too much and will spending the next few days cooped up in bed post-wisdom teeth surgery being paranoid about dry sockets and making the rounds visiting all of your pretty blogs. :) Let's celebrate with some dessert! 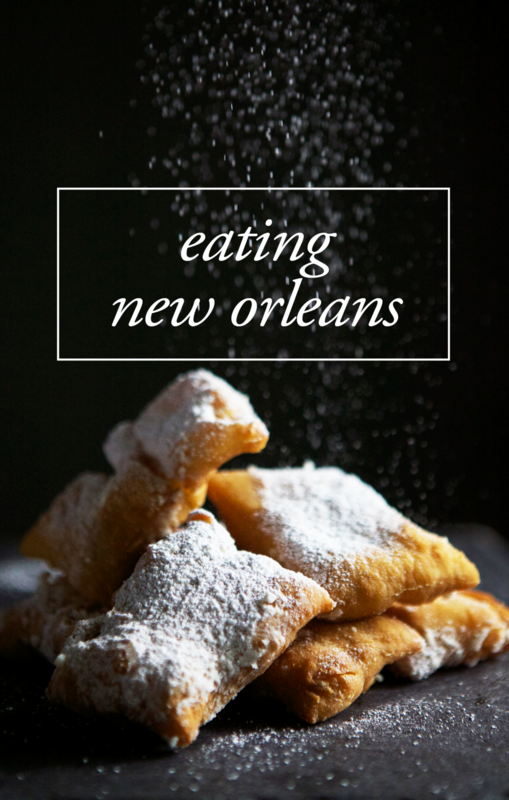 A few days ago, French Market Coffee sent me a giant box of coffee and challenged me to create a killer New Orleans-themed recipe. I obviously obliged, because coffee is the sole reason why I got through this semester from hell and coffee plus dessert is the greatest combination like.... ever. Now I know what you're thinking, Vietnamese iced coffee .... New Orleans??? Did you know that New Orleans has thriving Vietnamese population and a killer Viet restaurant scene? Did you know that my diet pretty much consists of nothing but banh mi and spring rolls? Did you know that Vietnamese is the fourth most spoken language in the entire state of Louisiana? Did you know that I just looked that up on Wikipedia? Bam. Because Vietnamese iced coffee is the delicious marriage of chicory coffee and condensed milk, I figured I would deconstruct it and turn it into something even more delicious than the drink itself. The result: granita sundaes. Granitas are generally served alone or with a bit of whipped cream, but I truly believe in calorie-loading so I covered mine in layers upon layers of ice cream. Condensed milk ice cream, to be exact. On top of all of that, I covered the whole deal in even more condensed milk, because why not? I know this all sounds potentially stressful, but this dessert is super easy! The granita is literally just coffee and sugar, mixed, frozen, and sloshed around with a fork a few times. The ice cream is a no-churn situation, with only three ingredients and a quick freeze. You can even lie and act like you broke out that fancy Cuisinart ice cream maker that you've never used, I won't tell! Promise! Brb, I'll be eating the leftover granita for the rest of my summer. In a medium-sized bowl, dissolve the sugar in the hot coffee. Once dissolved, stir in vanilla. Transfer the mixture into an 8-inch metal baking pan. Freeze the mixture, making sure to stir the mixture vigorously with a fork every 30 minutes until slushy, about 2 hours. Using a hand mixer or stand mixer fitted with the whisk attachment, whip the cold heavy cream and vanilla on high until soft peaks form. Gradually add the condensed milk and continue whipping until high peaks form. Transfer the mixture into a bowl or loaf pan and freeze until set, at least four hours or overnight. When ready to serve, layer the granita and ice cream in a bowl or coffee mug. Drizzle with extra condensed milk! This post is sponsored by French Market Coffee. All opinions are my own and this sundae is literally amazing so don't be fooled.